High Efficiency Optimized for PAR, Extremely Sufficient Lights Spectrum, Super Light Penetration. Plants grow faster and flower bigger: Enhanced spectral output covering full PAR (380-800nm) promotes photosynthesis. For Growth & Bloomming, Powerful Cooling fan system inside, Cool and Quieter. Revolutionary Heat Aluminium PCB, Run 80% cooler than high intensity discharge (HID) lights. All LEDs with a Zener to ensure One LED Goes Out the Rest Continue to Operate. 3 years Long Life, Energy Saving and Environmental Protection. 4PCS200W high intensityCOB(643W chip on board). View Angle: 120 degree Reflector. 9 Bands for Indoor Plants Growth & Flower. Spectrum of Light: 28pcs 660nm 16pcs 640nm;8pcs 440nm;4pcs 460nm;4pcs 470nm;2pcs 525nm;2pcs 730nm. 1 x 800W LED Grow Panel Light. 2 x Stainless Steel hanging kits. Please note:Before using LED grow light, you should separate from HPS(High Pressure Sodium) lamp. They can not work together. If not, LED grow light will burning out. Our grow tent has all stable construction, 600D oxford cloth outside and 96% highly reflective waterproof diamond Mylar inside, with exterior zippers design ensure safety use and easy to set up. And it also has multiple vents to accommodate fans and filter. Great for you to grow exotic fruits, herbs, vegetables or seasonal fruits out of season. We promise to provide you with the highest-quality hydroponics equipment and services at our factory-direct prices. Inside: 96% highly reflective waterproof diamond Mylar(enhance the reflective effect). Outside: heavy duty 600D lightproof oxford cloth. Frame: diameter16MM white paint coated metal rods. Connector Material: 16MM (diameter) sturdy connectors. Large heavy duty Zippers & Double Stitching for protection against light leaks. Rectangle vents with mesh for better ventilation. Multiple vents for fan and filter output. 1x 96% 600D reflective Growing Tent Cover. 1 set 16MM frame of rods and connectors. 1x Removable Water-proof Floor Tray. 2x Nylon Belts can be used for Filter Straps. 4'' / 6'' Inline Fan Carbon Air Filter Ducting Combo. 4" Flange: 10"H x 7D. 6" Flange: 18"H x 9D. Iodine Adsorption Value: 950 (High efficiency). Carbon Layer Thickness: 1.5 inches. Endurable Temperature: 400 degrees Celsius (Safer). Operating Environment Temperature: -20 to 65 degrees Celsius. Use Coal Based activated carbon. Changeable Velcro Pre-filter with 2 black elastic bands. Thick Carbon Layer for Higher Absorption and Performance. Exceptional odor control for better privacy. Inner and outer mesh provides 53% open area allowing increased air flow. Machine packed carbon enables 100% filtered air flow. 11.5 years in life expectancy. 120V60HZ; 101Watt; 0.86A; 2850RPM; 189CFM. 120V60HZ; 174Watt; 1.45A; 2780RPM; 460CFM. Come completely wired with junction box, strain relief and power cord. Lightweight and easy to install. Fluted on both ends to receive ducting. 4" Double layer duct 4" 25FT. 6" Double layer duct 6" 25FT. Size: 4"1/2 6"1/2. 1xCoal Based Activated Carbon Air Filter. 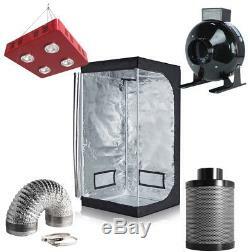 The item "800W LED Light + Grow Tent + 4 / 6'' Inline Fan Carbon Air Filter Ducting Combo" is in sale since Saturday, May 26, 2018.